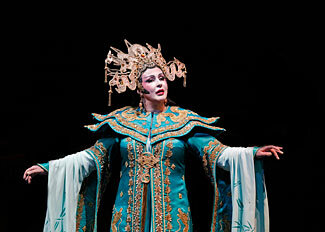 September brought another Turandot to California. The state has been awash with this Puccini staple this year. San Diego Opera kicked off their 2011 season in January with an excellent Lise Lindstrom in the title role, and the Los Angeles Philharmonic offered a one-off concert performance of the work with Christine Brewer at the Hollywood Bowl this summer. 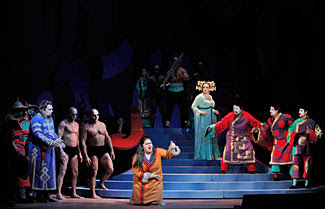 Not to be outdone, San Francisco Opera also started their season with Turandot with their own home-grown David Hockney/Ian Falconer-designed production, the same one San Diego used earlier this year. On Sunday I saw the fifth performance in the current run with the first of two casts that will keep the show going for 10 performances through November. It was a solid, lively show, which has been justly well-received and was clearly popular among Sunday’s capacity audience. Gockley then told us we would sing the national anthem. That is until he was corrected and he then told us that it would only be sung at the ball park. Of course, San Francisco Opera audiences have gotten very used to this these days so all of this confusion sparked of a good bit of clucking in the auditorium. As it turned out, though, we had plenty of time to sing it anyway, considering that it took the next 15 minutes or so to repair the front curtain, which failed to go up after conductor Nicola Luisotti had already started the performance. He stopped, of course, leaving the audience in an awkward silence that was periodically filled out with all sorts of shouted commentary meant to entertain including a spontaneous round of the Star-Spangled Banner. As it turns out, one doesn’t need a giant multimillion dollar machine of a set in order to delay the start of an opera, a good old-fashioned malfunctioning stage curtain will do it just as well. Of course, the performance that followed this was actually quite good. Hockney and Falconer’s design is colorfully lurid and this time around the company had packed the stage with a super-sized chorus and supernumeraries galore for the complete grand opera effect. The chorus was excellent and the soloists recruited for the first half of this run were uniformly first rate. Iréne Theorin is a Wagnerian soprano in much demand these days and she delivered one of the best Turandots I’ve heard on a major stage in recent years. Her tone was even and piercing and she handled the tessitura with ease. She can project a regal air and her voice never turned shrill. Marco Berti sang Calaf. He seemed to be saving himself in the first act, but considering that he delivered the goods later on, it only seemed fair. And Leah Crocetto’s Liu felt like a major arrival. Crocetto is a recent Merola Fellow and she shone brightly here with real vocal tenderness and strength. I have heard her onstage in Los Angeles as well, and this Liu definitely makes me eager to hear her sing more. Music Director Nicola Luisotti was in the pit for the only production he's helmed so far this year in San Francisco. He took an approach not unlike Gustavo Dudamel did in Los Angeles over the summer looking for all the pumped up energy to make the biggest big moments possible. It was certainly dramatic, though musically it did sacrifice some detail and musicality. But with a show that's pulling out all the stops elsewhere, it's what you'd expect and this Turandot certainly delivers with some big excitement. I was going to skip Turandot this year, but as I was watching the mediocre Borgia tonight I realized it was probably going to be the best thing in a fall season that so far is batting just above .000 in my book so I might as well just give up and go. Your post sealed the deal. Crocetto is quite good and I'm eager to hear Theorin in person for the first time. I thought she was great in the Copenhagen Ring.